What does this mean for the MYR? 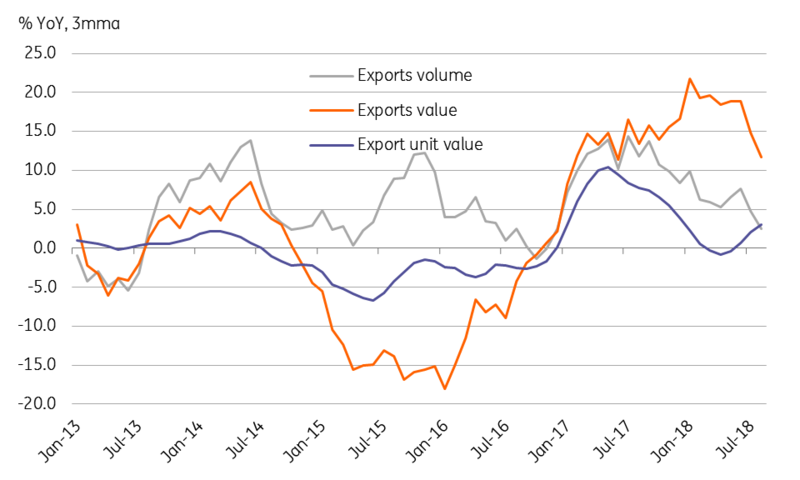 Imports, however, surprised on the upside in August with 11.2% growth (consensus 9.4%) and this was faster than 10.3% expansion in July. This caused a sharp narrowing of the trade surplus to MYR 1.6bn from MYR 8.3bn over the same months. Notwithstanding a sharp narrowing in August, the cumulative surplus of MYR 70.5bn in the first eight months of the year was still MYR 7.5bn wider on the year, which is positive for the MYR. Also released today, Malaysia’s foreign exchange reserves fell for the fourth straight month in September to $103bn. The 1.3% month-on-month fall was the second-biggest after a 3.5% fall in June. The MYR performance is positively correlated with the global oil price. However, the currency’s shift from being a top-performing Asia ex-Japan currency in the first half of the year to the middle of the pack appears to be inconsistent with the firmer oil price and steady terms of trade (see figure). 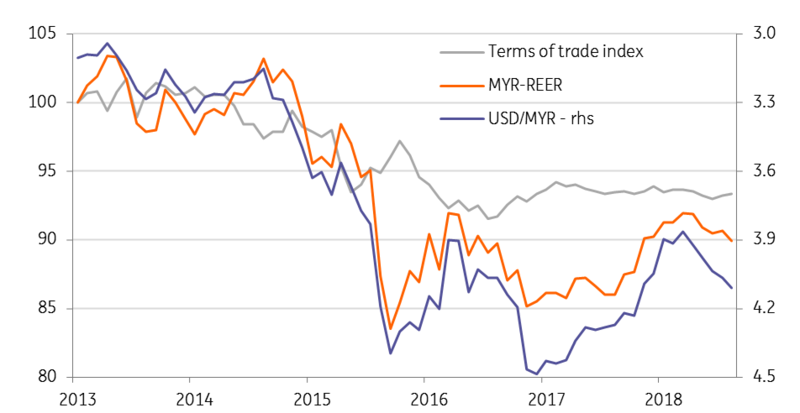 The clawback of the MYR’s recent underperformance relative to the oil price will hinge on the trajectory exports and GDP growth will now take, though today’s weak export report doesn’t bode well here. However, just based on continued positive terms of trade from the rising cost of crude, we see scope for a reversal of some undervaluation going forward. That said, we maintain our end-year USD/MYR forecast of 4.25 (spot 4.15).